Tommy Caldwell poses for a portrait after just climbing to the top of Tadrarate via a 500m, 7c climbing route. He's climbing with Alex Honnold in Taghia, Morocco. September 20th, 2016. In Yosemite National Park in California, a famous mountain called El Capitan beckons climbers around the world, a sheer granite rock face called the Dawn Wall seemed impossible to ascend without equipment. In 2015, Tommy Caldwell along with Kevin Jorgeson became the first to climb the Dawn Wall using only their bloodied hands and feet inching along the crevasses, a rope tied to their waist was used to keep from free falling thousands of feet. And as difficult as that climb was, Caldwell has experienced even more dangerous situations. Back in 2000, he was kidnapped by militants along with three other American climbers in the Kyrgystan mountains. So what keeps him going? Caldwell answers these questions in his new autobiography "The Push: A Climber's Journey Of Endurance, Risk And Going Beyond Limits." Tommy Caldwell joins us from community station KGNU in Boulder, Colo. Welcome to the program. 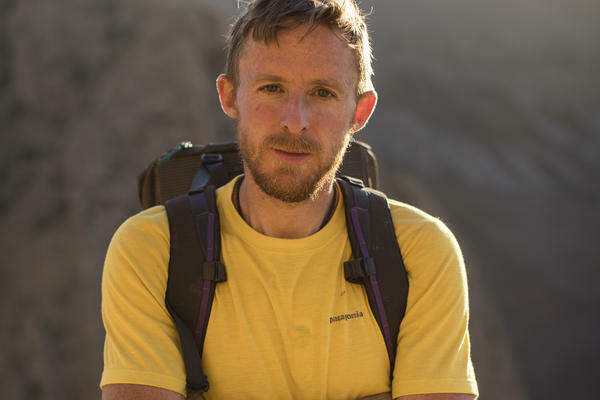 TOMMY CALDWELL: Thank you very much. SINGH: You are considered a legend in the rock climbing world, but as a child, you describe yourself as small and socially awkward. Can you tell us about that time in your life? And how it geared you toward climbing? CALDWELL: I mean, I was - I would say quite small physically, and I had eye coordination issues as a child which kept me in remedial reading classes. And I just didn't fit in in a normal social environment, and that is probably one of the things that drew me to climbing because in climbing, you can just go out into nature. If you don't have to worry about socializing because you don't like it, you can more fully immerse yourself in climbing. SINGH: You've talked a lot about your dad. You wanted to be just like him. CALDWELL: Yeah, I mean, my dad was a bodybuilder when I was a young child and then a mountain guide. Around the time I was 4 years old, he really took up rock climbing. When I was super young, we were hiking to the top of the 14,000-foot peaks in Colorado. You know, when I was in my early teens, we went to Bolivia and climbed to the tops of the highest mountains in the Alps. You know, those experiences were so exciting that when I came back to school, I was actually quite bored. SINGH: As a teenager, you decided to skip university and climb full time making money through competing, I guess, in climbing competitions. But you lived in a van - right? - long before that was, of course, Instagram cool because now it is so - it sure did not seem easy at the time. There must have been stuff that you had to give up in order to pursue the most important thing it seemed in your life at the time which was climbing. CALDWELL: Yeah. I had to give up any semblance of a normal life. Like, I lived on about $50 a month. So I didn't have much in terms of materialistic items, but the climber ethos, the climber culture is all about sacrifice and full immersion into climbing. And so thats what I was all about. SINGH: OK. And then, of course, that takes us to an interesting chapter in your life, this sense of adventure that sort of led you to an expedition in a remote area of Kyrgyzstan. It became national news. Many of us will recall when you and three other climbers were held hostage by rebels who were associated with the Taliban and al-Qaida. Tommy, could you take us back for a bit? Tell us a little bit about what you remember from - what was it? - 17 years ago? CALDWELL: I was young. I was idealistic. I would say I was relatively naive, but extremely adventurous. So there was some warnings about going into the area, but as climbers we sort of have this idea that if we pay attention to all the potential dangers, we'd never go climbing in the first place. So we decided to just change our location and climb up the (unintelligible) valley and hope that everything went OK. And it didn't. There was a war that broke out while we were there. The Islamic Movement of Uzbekistan sort of moved over these mountain passes, and they walked up this valley and found us. And we were captives for six days until we eventually escaped. And the way that we escaped is that I actually ended up pushing one of our captors off a cliff, and we ran for it. And this was truly a coming of age moment for me in kind of a life inflection point. SINGH: Do you think a lot about that moment of having to push one of the captors off the cliff knowing that you needed to survive? CALDWELL: I initially wanted to write this book because I wanted to go to that place. You know, I've kind of - I think most people who know me view me as a very focused person. I tend to walk through life sort of looking through a pair of binoculars, and I focus on certain things and push out the rest. And I wanted to change that. You know, I wanted to understand how that experience shaped me and what it did. And so the first scene that I wrote in this book was that moment when I pushed the guy in Kyrgyzstan. And it was really a personal meditation, and it was super powerful. And so really a lot of my climbing life since then has been an effort to understand more about that. And so I've picked these big objectives and then pursued them very vigorously. And in a way, that climb of the Dawn Wall was just trying to pick the biggest objective that I could find so that I could live this life of pursuit which I absolutely love. SINGH: So this led you to your most famous climb, the Dawn Wall of El Capitan, along with free climber Kevin Jorgeson. The trek took 19 days, but I understand the planning took like seven years. CALDWELL: I'd spent more time on El Cap than probably anyone. And so I recognized that I was the one person that could view this section of the wall that looked so blank. Like, from the ground it seemed as though there was nothing to hold to. And it was so big and so steep. That's what inspired me, the doubt of whether it could be done. And so I spent a year plotting the route, swinging around on ropes, feeling the holes, linking together the individual moves and really viewing it on this microscopic level. The eventual 19 days was the push. It was like everything before that was the rehearsal. And then that 19 days was the performance. SINGH: What kinds of emotions did you experience after you knew you completed this major lifelong goal? CALDWELL: Really the most powerful moment was the morning before we topped out. I knew that success was inevitable, and I was there with just Kevin and me, the sun rising and there was this very beautiful moment of just like all your dreams have come true. You've worked towards this thing for so long. The other side is when we topped out, we were surrounded by reporters and all of a sudden I felt like I was being pulled in a million different directions, and it hit me that the pursuit of this thing was actually over. That was hard for me, and it was also sad. SINGH: So what's next for you? CALDWELL: You know, I think I spent seven years working on the Dawn Wall and then after that I jumped right into writing this book and then I had a daughter. So I have been quite busy. CALDWELL: Yeah. And I have a son as well. SINGH: You know, I was just curious. Are you one to do with your kids what your dad did with you? CALDWELL: For now, yes. I think I will probably contemplate the risk side of it a little bit differently than my father did. CALDWELL: I think he almost killed me a lot a lot of times when I was a child (laughter) unintentionally. I mean, we did some pretty crazy things. So the fact that I learned to go out on these big adventures and love that so much made it so that I viewed risk differently. I thought that exposing myself to really risky things was absolutely worth it. I think I want my kids to think a little more deeply about that because I love them so much, and I don't want them to get killed off, you know? SINGH: I think we would all understand your feelings and your trepidation about this. That was Tommy Caldwell, world renowned rock climber from Colorado. He joined us from community station KGNU in Boulder. His new book "The Push: A Climber's Journey Of Endurance, Risk And Going Beyond Limits" is out May 16. Tommy, thank you so much for coming on the program. CALDWELL: Thank you. Transcript provided by NPR, Copyright NPR.